Ambrose "Bruce" Walters was the father of major league motorcycle racing in Peoria. As a 15-year-old Iowan, he bought his first motorcycle in 1913, and until his death in 1980 at the age of 82, he was involved with the speedy machines every day of his life. 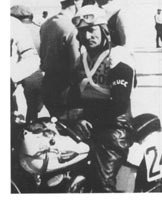 Walters was an early member of the American Motorcycle Associationís (AMA) competition committee, and it was through his dedicated work with the AMA that national championship racing was brought to Peoria in 1947. The race continues today, making the famed Peoria TT event the oldest continually run dirt track race in the country. 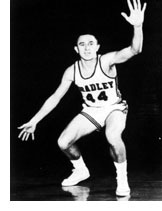 The AMA recognized Bruce Walters' long service by making him one of the earliest winners of the prestigious Dud Perkins Award. Before all that, Walters was a determined competitor. He and his late wife, Gladys, traveled throughout the land to flat track races, hill climbs, TT tracks and such major events as the Daytona 200. Strongly built and a fierce competitor, he raced until he was 48 years old, and then competed in cross-country races until he was 67. He entered Michigan's grueling Jack Pine Enduro event of 500 miles 26 times. While he was in the early years of competition, Bruce and his brother Bob opened a Harley Davidson dealership in Galesburg, and in 1931, Bruce moved to Peoria to open a Harley dealership here. Walters was instrumental in the founding of the Peoria Motorcycle Club and the construction of the famed half-mile TT track that over the years has attracted every big name in the major leagues of motorcycle racing.